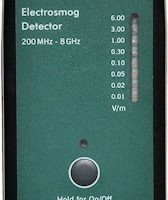 Pocket-sized electric field monitor with 10 coloured LED lights providing measurements in volts per metre, from 0 – 240 V/m. Ideal for all electric fields from electrical sources at frequencies between 15-1500 Hz. 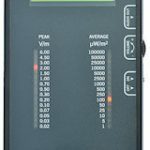 the ELF Monitor (left) detects and measures electromagnetic radiation from electrical appliances and equipment, building wiring, electricity pylons, power lines and transformers.